Traditional gun safes do not stop thieves or fires. They are just metal and drywall. One can cut through a safe in minutes with a $10 saw, and, if you have a significant fire, your guns are toast. That’s why we built the Agile Model 52. It’s the ultralight gun safe. It does what a gun safe does without being horribly heavy or hard to move. Plus, you get CradleGrid™ Technology. Firearm storage has not changed in half a century. Until now! Thanks to Knockdown™ Technology (patent pending), Agile ultralight gun safes ship and store flat. Assembly is extremely easy and can be done in minutes by a single person with just one wrench. All assembly is internal, so it’s inaccessible when locked. Unlike traditional gun safes, which are heavy and hard to move, an Agile ultralight gun safe can readily be moved wherever and whenever you wish. 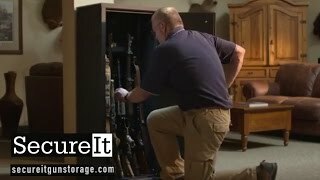 Watch the SecureIt TV commercial featuring the Agile ultralight gun safe.